BC 2032 was planned as a series of 13 episodes, but production stopped at 8, officially because of a poor success (in Japan). It seems that the real problem was about royalties between co-producers, involving two different studios. 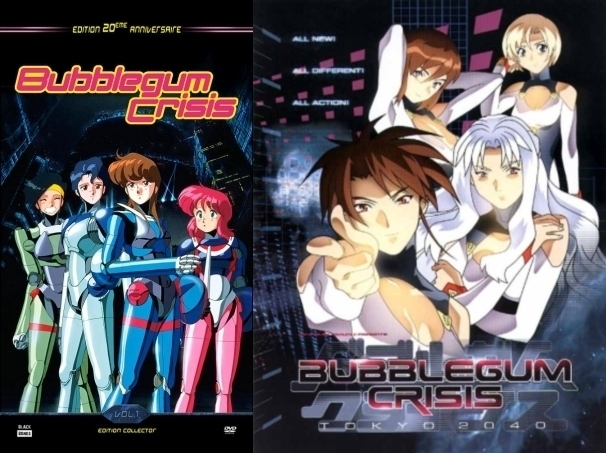 They split, and one of them continued the OVA under a new title : Bubblegum Crash – but shortly afterwards, it ended by going to court, and the Bubblegum Crisis Licence was left unexploited. Years passing, a real fandom rose (especially in Europe and in the United States), producing fanzines, mangas, comics, some by professional studios (for example a Bubblegum Crisis comics by Dark Horse). 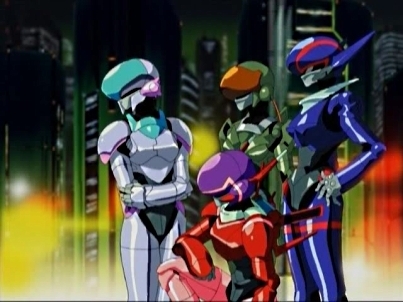 Fans waited until 1998, when AIC developed a new project : Bubblegum Crisis : Tokyo 2040. And, surprise, instead of giving an end to the cult BC 2032, we got a real new anime, starting over at the beginning of the whole story. Each of the 26 episodes is about 20 minutes long, and ends with a cliffhanger, until the final (and apocalyptic) conclusion. Same story, same background, same characters – but a new storytelling, first episode starts with the formation of the Knight Sabers. They have only three members when a fourth girl, Linna, eventually joins the group. We follow her as she arrives from her country village in Megatokyo, seeking a job. She witnesses a Sabers operation against a crazy boomer, and decides to join them. 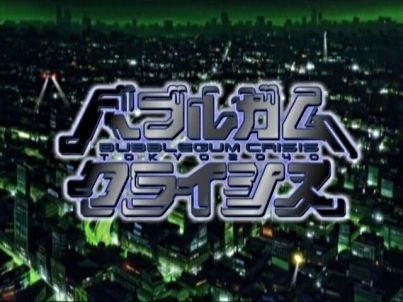 The whole story, along the 26 episodes, spots on a main plot : GENOM’s secret plans, what really boomers are, and why they become out of control, Syllia’s past, and how (why) her father died int the gigantic Tokyo earthquake 15 years ago. I have seen BC 2032 and BC 2040 one after the other, and I am unable to decide between. In fact, they are complementary, and I would advise you to watch both, as a complete program. BC 2032 is attractive mostly because of its vintage music and atmosphere, and offensive charm of feminine characters. But I must admit the first OVA lacks consistency, especially after the 6th episode, because of the production’s problems. Too many elements remain unexplained, and it has no real ending. BC 2040 deserves credit for starting over the whole plot, and giving it a new coherence. And it also brings the so much expected ending, and that was worth it. Believe me. Until the final climax, each episode grows an real suspense ; I even thought about a possible parallel between BC 2040 and Neon Genesis Evangelion – I will develop this point further. The result is convincing, although I think the updating makes the heroines look more like mainstream anime characters, loosing this typical Kenichi Sonoda touch. Still, the armour design remains the same, and that’s a good thing. Settings are really improved, keeping the cold, dark and gloomy atmosphere of a nocturnal city, haunted with dangerous creatures. Less violence, less dirty humor, more psychology. More depth in the depiction of the main characters, though. The four girls have a deeper background, and their motivation, their state of mind, their personal life are more detailed. We follow them in their everyday life, and the story spots on Priss Asagari, the rock singer, who becomes the main character of the whole series. By the way, rock’n'roll is even more in the heart of the story. More actual, less eighties, Priss’s rock band has new songs with different styles including ballads or hard rock. We even meet the other musicians, who are part of the story. Several points make me think that Neon Genesis Evangelion may have influenced BC 2040. Let’s take the plot for instance. The 26 episodes focus on the GENOM affair. It starts with an earthquake, but the reasons remain unclear. Was it a natural phenomenon? or the result of a forbidden experience? - on the other hand, a maverick group of young vigilantes, fighting in armours but whose equipment may also use this brand new technology. The main question is : who manipulates who? Are GENOM and the Knight Sabers ennemies, or two antagonistic visions of the same project? What are the consequences for the future of the human race? Other questions are : what are really the boomers? robots? cyborgs? or a new avatar of the human race? Who is really Syllia Stingray, and what does she seeks, using the Knight Sabers against GENOM? I won’t spoil about the ending, but some shots really made me think of the End of Evangelion. Well, ok, BC 2040 does not go as far EoE, still this almost apocalyptic and mystic turn is somehow similar. As a conclusion, I will say that both BC 2032 and BC 2040 are worth seeing, but I can only dream of what the result might have look like, if BC 2032 had not been interrupted, or if BC 2040 had kept the first OVA’s design and atmosphere. Bubblegum Crisis is not a masterpiece, it’s only a very good anime in its actual form, consisting of two different versions. Maybe, the final cut remains to be done. This entry was posted in anime, archives and tagged anime, Bubblegum Crisis, cyberpunk, english version, Evangelion, girls, mécha, robots, science-fiction. Bookmark the permalink. Rien qu’entrer sur votre blog me procure énormément de bien !